Home FIFA Sports Brazil crash out of world cup after 2-1 defeat, as DeBryne sends home "Samba Boys"
Brazil crash out of world cup after 2-1 defeat, as DeBryne sends home "Samba Boys"
Belgium produced a blistering display to knock out five-time winners Brazil and book a World Cup semi-final spot against France. The Belgians ran out 2-1 winners in a frantic encounter in Kazan thanks to two first-half goals, the opener coming from a 13th-minute Fernandinho own goal before Kevin De Bruyne rifled home a second from the edge of the box on the half-hour mark. Substitute Renato Augusto pulled a goal back for Brazil with a 75th-minute header to set up a thrilling end to the game, but Belgium held on as worthy winners to set up a semi-final against France, who earlier saw off Uruguay in their quarter-final. 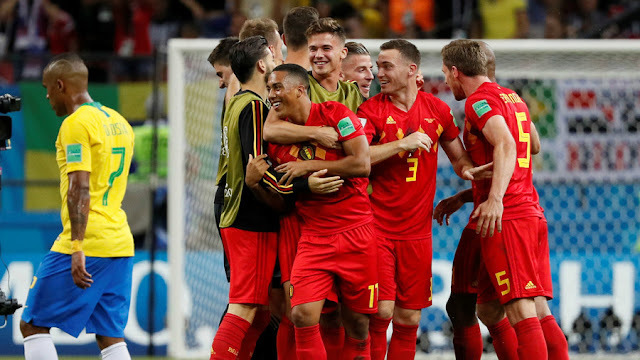 Belgium’s ‘Golden Generation’ had largely failed to live up to their tag with disappointing quarter-final exits at their last two major tournaments, but now have a golden chance at glory in Russia after beating a Brazil team that had largely flattered to deceive. The Brazilians had made largely untroubled progress through the group stages before easing past Mexico in the last 16, but came up against an inspired Belgium who were in Kazan courtesy of stunning comeback win against Japan in their last game. 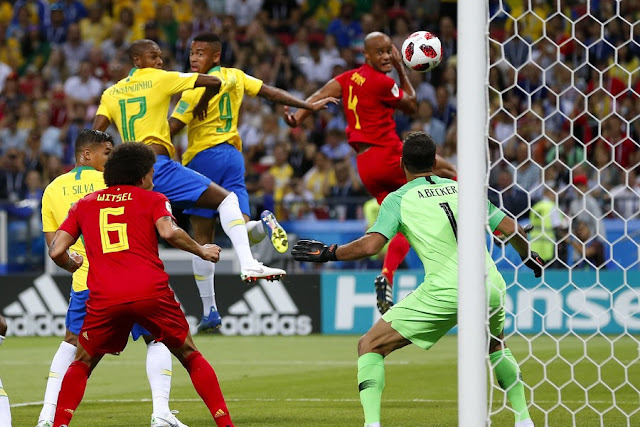 The opening stages saw an intensity that would set the pace for the remainder of the game, as Brazil pressed high up the pitch while Belgium initially saw more of the ball. Marouane Fellaini, who was in the starting team after his starring role in the comeback against Japan, made his presence felt by raking his arm across the back of Neymar’s head, giving the much-maligned Brazilian more cause to go to ground than had perhaps been the case in Russia up to that point. It was Brazil though who had the first real chance on seven minutes, when Thiago Silva somehow failed to turn home a Neymar corner from four yards out when completely unmarked, with perhaps the only extenuating circumstances being that the ball had arrived quickly from a Miranda flick-on. Belgium looked rattled at the back every time Brazil pressed from set pieces, and Paulinho spurned another chance when unmarked at a corner. Brazil mainly restricted Belgium to shots from range, and Nacer Chadli dragged his shot wide after good build-up play from Romelu Lukaku – a sign of the growing influence the big striker was exerting on the game. It was Belgium who took the lead on 13 minutes when Brazil’s own frailties at set pieces were exposed, as Fernandinho mistimed his jump from a Chadli corner, the ball bouncing off his arm and past Alisson into the net. Brazil found themselves behind for the first time in Russia, but attempted to strike back immediately, with Neymar breaking free on the left and Gabriel Jesus almost scrambling home from the resulting cross. Philippe Coutinho – Brazil’s player of the tournament – introduced himself to the game by testing Thibaut Courtois from 25 yards, and the Belgian stopper was also equal to a Marcelo effort from range. The intensity continued as Brazil went in search of the equalizer, although they continued to look porous at the back, especially with the pace and energy of Belgian captain Eden Hazard and Lukaku’s powerful running. It was the latter who burst through from his own half on 31 minutes, leaving a flailing Brazilian midfield in his wake before laying the ball off on the edge of the box to De Bruyne, who rifled past the outstretched hand of Alisson and into the left-hand corner to double the lead. Brazil were facing their biggest test under Tite as Lukaku in particular continued to run their backline ragged, but they roused themselves to test Courtois, who produced a double stop to push away a Marcelo cross before denying Coutinho. 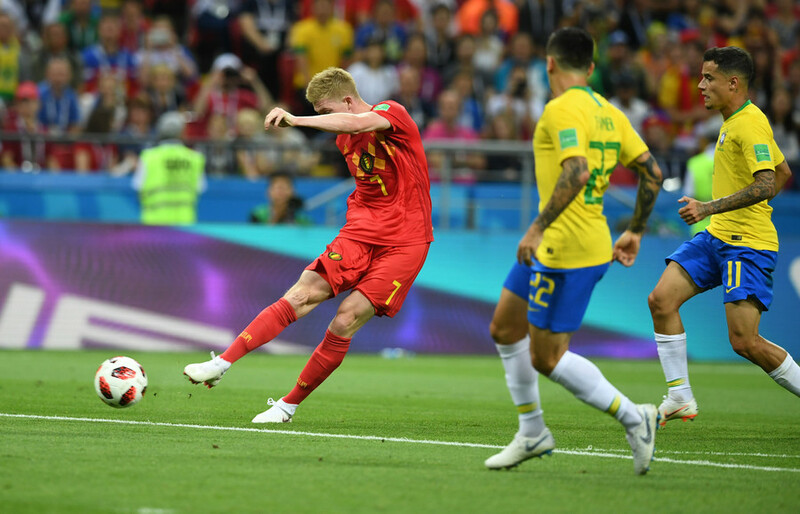 Belgium had chances of their own through a De Bruyne free-kick, while a backheel from Vincent Kompany at a corner drew a stop from Alisson. Tite brought Roberto Firmino on in place of Willian at the break as Brazil aimed to wrest control of the game, but Belgium started the second half as they ended the first, with Lukaku stating his intent with another powerful break forward. Brazil thought they had cause for a penalty when Neymar threw himself to the floor after brushing past Fellaini, but replays showed zero contact and referee Milorad Mazic did not trouble the VAR. The referee did go to the video assistant referees just moments later, when Gabriel Jesus went down from a Kompany challenge with the ball running out of play, but no spot-kick was awarded. Brazil pressed but Belgium remained dangerous on the break, and Hazard flashed across goal from a counter-attack on the hour mark. Lukaku’s first touch deserted him on more than one occasion but he remained full of running as Belgium’s main attacking outlet. Brazil finally burst into life to set up a thrilling finale when substitute Renato Augusto turned home a header from a Coutinho cross with 15 minutes to play. Coutinho himself fired agonizingly wide moments later after a lovely turn and shot in the box, as Belgium rocked at the back, and Augusto came within yards of equalizing with a shot from the edge of the box. Neymar had time for one last touch of theatrics as he threw himself to the floor after minimal contact when challenging for a header in injury time, but the referee was again unmoved, although the Brazil number 10 forced a finger-tip save from Courtois moments later. But Belgium held firm and Brazil were on their way out – leaving solely European representatives left in Russia. For Belgium and Roberto Martinez it means a semi-final test in St. Petersburg against an equally-fancied French team. A mouth-watering prospect awaits.